A fun appetiser to serve guests straight off the fryer. Combine self-rising flour, cornflour and salt. Divide evenly into two bowls. Add chilled water to one, whisking to make a batter. 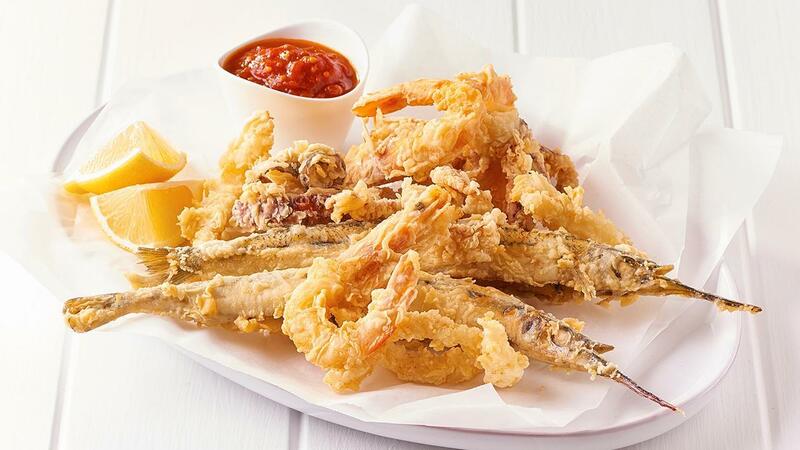 Pat seafood dry with paper towel, dip in batter, then into dry flour mixture and deep fry in batches for 2-4 minutes depending on size until golden and crisp. Remove, drain on paper towel and season. Serve on a platter layered with baking paper, with tomato relish and lemon on the side.